DR. ERWIN LUTZER Since 1980, Dr. Erwin W. Lutzer has served as Senior ^Pastor of The Moody Church in Chicago, where he provides leadership to Chicago pastors. ^A renowned theologian, Dr. Lutzer earned his B.Th. from Winnipeg Bible College, ^a Th.M. from Dallas Theological Seminary, an M.A. in Philosophy from Loyola University, ^and an honorary LL.D. from Simon Greenleaf School of Law.He is the featured speaker ^on three radio programs including the Sunday morning worship service, "Moody Church ^Hour"; the popular evening program "Songs in the Night"; as well as the daily broadcast ^"Running to Win." These programs are heard on more than 700 radio stations in the ^United States and around the world. Dr. Lutzer is also an award-winning author of ^numerous books including: The King Is Coming, One Minute After You Die, When ^a Nation Forgets God, When You've Been Wronged, Christ Among Other gods, Life-Changing ^Bible Verses You Should Know, and Hitler's Cross, which received the ^Christian Bookseller's Gold Medallion Award. His speaking engagements outside the ^pulpit of The Moody Church include Bible conferences and seminars, both domestically ^and internationally. He has led tours to Israel and to the cities of the Protestant ^Reformation in Europe. Dr. Lutzer and his wife, Rebecca, live in the Chicago area ^and have three grown children and eight grandchildren. When the world's most powerful celebrity (according to Forbes magazine) ^personally teaches a course on miracles, millions will join her class - including ^many believers. What will happen when the coursework blends inspiration and encouragement ^with some of the oldest heresies in the Enemy's arsenal? People you know and love ^may dismiss the claims of Jesus Christ as the only way to God. Dr. Erwin ^Lutzer's insight and clarity reveals the true nature of contemporary spirituality, ^tracing its roots across a range of false belief systems and back to its first appearance ^in the garden of Eden. In a day when so many seek direction from the media, it remains ^essential to carefully discern between truth and the lie. When the world's most powerful celebrity (according to Forbes magazine) ^personally teaches a course on miracles, millions will join her class-including ^many believers. What will happen when the coursework blends inspiration and encouragement ^with some of the oldest heresies in the Enemy's arsenal? People you know and love ^may dismiss the claims of Jesus Christ as the only way to God. 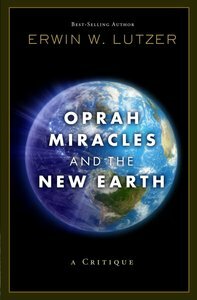 When the world's most powerful celebrity (according to Forbes magazine) personally teaches a course on miracles, millions will join her class - including many believers. What will happen when the coursework blends inspiration and encouragement with some of the oldest heresies in the Enemy's arsenal? People you know and love may dismiss the claims of Jesus Christ as the only way to God. Dr. Erwin Lutzer's insight and clarity reveals the true nature of contemporary spirituality, tracing its roots across a range of false belief systems and back to its first appearance in the garden of Eden. In a day when so many seek direction from the media, it remains essential to carefully discern between truth and the lie. ^Pastor of The Moody Church in Chicago, where he provides leadership to Chicago pastors. ^A renowned theologian, Dr. Lutzer earned his B.Th. from Winnipeg Bible College, ^a Th.M. from Dallas Theological Seminary, an M.A. in Philosophy from Loyola University, ^and an honorary LL.D. from Simon Greenleaf School of Law.He is the featured speaker ^on three radio programs including the Sunday morning worship service, "Moody Church ^Hour"; the popular evening program "Songs in the Night"; as well as the daily broadcast ^"Running to Win." These programs are heard on more than 700 radio stations in the ^United States and around the world. Dr. Lutzer is also an award-winning author of ^numerous books including: The King Is Coming, One Minute After You Die, When ^a Nation Forgets God, When You've Been Wronged, Christ Among Other gods, Life-Changing ^Bible Verses You Should Know, and Hitler's Cross, which received the ^Christian Bookseller's Gold Medallion Award. His speaking engagements outside the ^pulpit of The Moody Church include Bible conferences and seminars, both domestically ^and internationally. He has led tours to Israel and to the cities of the Protestant ^Reformation in Europe. Dr. Lutzer and his wife, Rebecca, live in the Chicago area ^and have three grown children and eight grandchildren.